Select Credits: Ma Liang and the Magic Paintbrush (co-writer and director) with Box of Delights Family Theatre, boom (Jo) and The Secret Love Life of Ophelia (Ophelia) with Kuala Lumpur Performing Arts Centre, Love and Light (Tanya) at the Short + Sweet Festival Malaysia 2008 (Runner Up, Best Actress award, since then renamed Best Supporting Actress award). 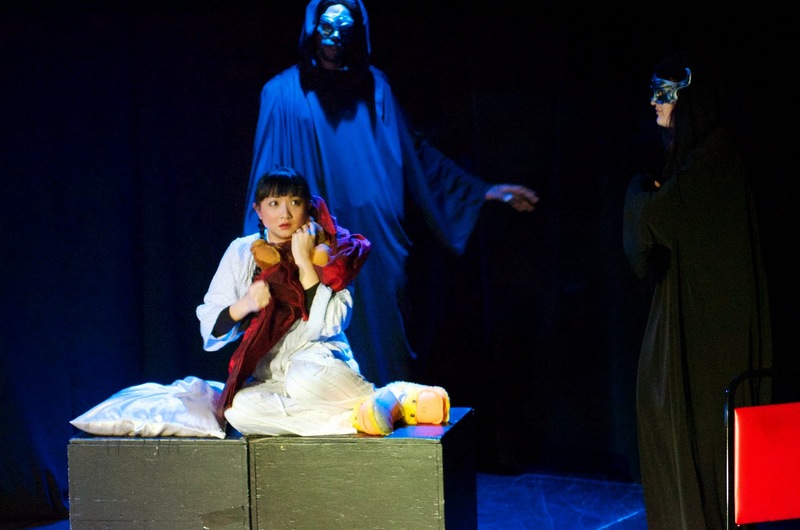 Most recent NYC credit: The Can Opener (Bobbi) at The Players Theater. Why theater? : When I was little, I came upon this comic series about a young girl who aspires to be an actress – a plain, simple girl with little to offer but her talent. It wasn't till 12 years later that I had my opportunity to pursue acting. The theatre has always been a wonderful space for people to come together for centuries – to tell stories, to create change, and as Hamlet puts it, “to hold, as 'twere, the mirror up to nature”. I believe that being an artist is a responsibility, and I love the theatre for allowing me to by myself and to be someone else at the same time. Who do you play in The Can Opener: A Brief Horror Musical? : I'm reprising my role as Bobbi, an intelligent but conflicted young woman who has fears and doubts about going to college. Tell us about The Can Opener: The Can Opener is the tale of young Bobbi who finds herself haunted by zombies in her sleep and tries to find comfort in the arms of her parents. What she finds, instead, will hopefully (and almost literally) blow your mind. A comedic coming-of-age story of sorts with beautiful music written by the talented Matthew Zachary Johnson (Boston Tea Party Opera), The Can Opener has its twists and surprises that will raise some questions (and eyebrows!) about humanity and what makes us human. What is it like being a part of The Can Opener? : Challenging, in a good way. Also really fun! What kind of theater speaks to you? What or who inspires you as an artist? : I believe all kinds of theatre speak to me. I like being open to different kinds of theatre and I have been throughout the years – from vaudeville to puppetry, improv comedy to theatre of the oppressed, musicals to clowning, and children's theatre to works on/by women. I do, however, have a strong inclination towards experimental theatre, especially because it takes a lot of courage to put something out there and to pave the way for generations to come, to see what works and what doesn't. What concerns me often is finding focus in one kind of theatre, and that can be difficult when I believe that being an artist is a responsibility, and I greatly want to affect change. Sometimes, the form of change can happen through the content, but very often change can happen even through the medium itself. A wise woman once told me that if I looked at things from a certain perspective, I would be able to see that entertainment, in its barest of values, can provide audience with an outlet to unplug, or to put themselves in someone else's shoe, even if just for a short moment. My greatest inspiration as an artist is knowing that as difficult as this life may be, I will have no regrets doing this. Who would play you in a movie about yourself and what would it be called? : Reese Witherspoon, and it would be called “The Living Contradiction”. If you could go back in time and see any play or musical you missed, what would it be? : The original Wicked with Idina Menzel and Kristin Chenoweth, and Who's Afraid of Virginia Woolf with Uta Hagen as Martha and Arthur Hill as George. What show have you recommended to your friends? : I've recommended quite a few. My latest recommendation would be If/Then, since it's closing on March 22nd. What’s your biggest guilty pleasure? : Sleeping in, making tie dye, and mochi ice cream. What’s up next? : I'm going to be in a new musical called Comfort Women, premiering off-Broadway in July. I'm also currently heavily researching the Hollywood icon Anna May Wong, considered the first Asian-American Hollywood icon, for a very interesting upcoming project with Michael Howard Studios as part of our second year conservatory.